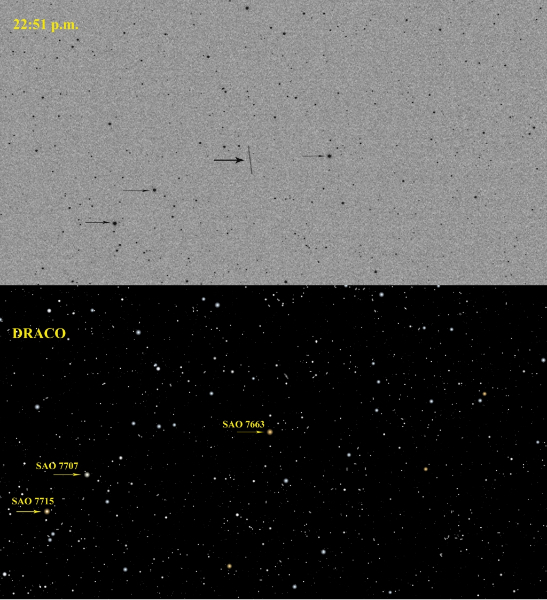 Well although I was clouded out last night I still managed to image asteroid 2012 DA14 through the thinnest part of the cloud 🙂 A single solitary one-minute exposure as the asteroid was moving through Draco at 22:51. 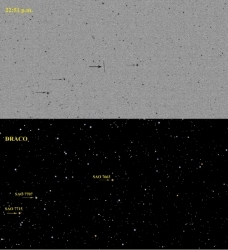 The planetarium screen shot shows the region of Draco with three stars arrowed – these are the corresponding three stars arrowed in the mini-WASP image. Nothing to shout about, but at least I got a record of the thing – and it was a huge bonus when I thought I’d got nothing.